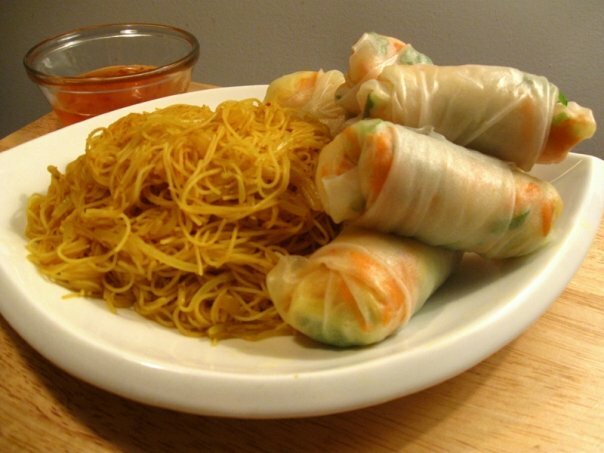 Making fresh rolls, instead of spring rolls or egg rolls is incredibly easy as the rice paper cooks so quickly. The only hard part is wrapping them. But honestly, it is A LOT easier than making sushi or something like that. So it is worth a try making theses at home. 1. Slice cucumber and carrot into thin strips. Slightly sautee shrimps with garlic in butter in a frying pan until they are cooked through. Keep shrimps whole, or consider slicing them in half for your rolls. 2. Spread out your fillings in bowls to get ready to prepare the rolls. Make sure you have a flat surface like a large plate or cutting board that you can put your rice paper out on. 3. In some boiling water, submerge each rice paper one by one. Will only take 1 minute to cook. After the rice paper is cooked and malleable. Put it on a flat surface and spoon in some of the carrots, cucumber, vermicelli noodles, and shrimp. Fold sides and bottom in, and roll up. 4. Take rolls and dip them in your favourite plum sauce, or sweet chili sauce. 1. Bowl some rice noodles in a pot until they are cooked through. 2. Mix curry powder, white wine vinegar, soy sauce, and sugar into a bowl or measuring cup and set aside. 3. Cut onion into small slices, and start frying them in a pan. While the onion is cooking, chop bean sprouts in about half or smaller pieces. When translucent, add in your noodles and bean sprouts. As they are cooking pour in your mixture of curry powder, vinegar, soy sauce, and sugar. Mix around until the noodles are all coated. Remove once the bean sprouts are cooked through.